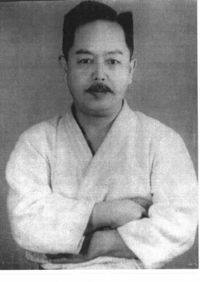 Kenwa Mabuni explained in his book Kobo Kenpo Karatedo Nyumon that the line of performance of a kata is very important. He wrote that when turning to face a new direction in kata it does not represent turning to face a new opponent. Instead, giving the examples of the first movements of the Pinan katas to the left and to the right, he describes that the angles they turn to indicate that when attacked from the front, you can evade to the left or the right of the opponent to put yourself into an advantageous position to defend yourself. This means that the angle taken by the kata indicates the angle you should take with respect to the opponent in order to make the technique or drill sequence function correctly. i.e. It is the angle of attack. Note that this would only apply to the initial movement of the drill sequence. Following movements would likely change the position of the opponent. More details and the full quotation can be found at the references below. 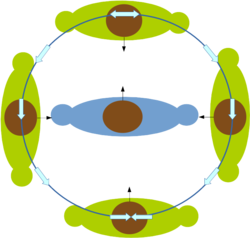 The turning movement then indicated by kata at the beginning of a drill sequence, is indicating a form of Copernican movement, which puts the opponent in the centre and moves the practitioner (tori) round the opponent (uke). 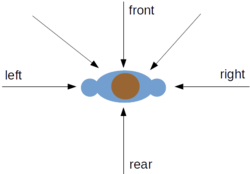 In the case of head movement, with the head always looking at uke, turns of the head then indicate that tori should move until uke is in the indicated position. This page was last edited on 23 January 2017, at 10:34.